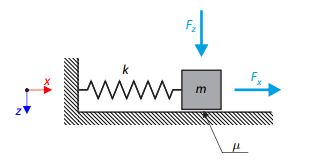 A simple oscillator consists of mass m (considered only in x-direction) and linear spring of stiﬀness k. The mass is embedded on a surface with Coulomb friction and is loaded by constant-in-time axial and transversal forces. A elastic supported node with consideration of the friction loaded by a cyclic load. Calculation of the deflection after reducing the external load. Determination of the maximum deflection of a cube. Cube's lower side is fully fixed and the upper side is subjected to the shear loading. Ricevi regolarmente informazioni riguardo notizie, consigli utili, eventi, offerte speciali e buoni. Sì, voglio iscrivermi alla newsletter gratuita di Dlubal Software. In futuro, in qualsiasi momento potrò annullare l'iscrizione alla newsletter qui o nella newsletter stessa.